A copy of the 1918 reprint of the original 1916 edition of The Adventures of Old Mr. Toad is housed in Ryerson University’s Children’s Literature Archive. The book is written by Thornton Waldo Burgess and is illustrated by Harrison Cady. It was published in Boston by Little, Brown, and Company and falls under the genre of nature stories and anthropomorphism. Anthropomorphism is defined as attributing human characteristics and emotions to non-living things and/or animals. I wish to connect Old Mr. Toad to the Great War. As America did not get involved until 1917, I will explore the publishing company’s decision to reprint the novel during the final year of the war. Due to the sparse information on the novel’s production and reception, I will be contributing new insights to this topic and will provide future researchers with a thoroughly investigated narrative. As well, my critical approach shall be oriented to the increase in demand for anthropomorphic children’s novels during WWI, in which Old Mr. Toad is an example. The Adventures of Old Mr. Toad begins with the character, Peter Rabbit, who, after hearing Mr. Toad sing rather beautifully, realizes that perhaps he had misjudged his friend. He relied on the inevitable fact that Mr. Toad was not physically attractive and thus could not sing well. Incidentally, he is proven wrong and attempts to get to know Mr. Toad better. He learns about Mr. Toad’s children, his beautiful eyes, his long tongue, and his ability to camouflage within small, dark spaces. As the novel progresses, so does the narrative perspective, shifting from Peter Rabbit to Old Mr. Toad. He encounters the terrifying Mr. Blacksnake and Buster Bear, but after dining on ants with Buster Bear, he no longer regards him as scary. Believing himself a very important friend of Buster Bear’s, puffed out with pride, Mr. Toad shuns his old friends. He believes himself better than them. In turn, they play a prank on him in order to teach him that he was behaving rudely. For unspecified reasons, Thornton Waldo Burgess was unable to participate in active service during the Great War (Burgess 134). However, he found three alternative methods of contributing to the war efforts on the homefront. This was done through the medium he knew best: storytelling. “The Green Meadow Club”, a column in the People’s Home Journal, contained entertaining and instructive stories on nature, written by Burgess, with illustrations by Harrison Cady. The club led a campaign during WWI to get children involved in the war efforts through donations (Meigs 33). The hope of this charity was to establish bird sanctuaries. The creation of these sanctuaries was intended to protect birds, as they were valuable in controlling troubling insects. As a result, this would help increase the production of food for the war. Burgess capitalized on this in his “Bedtime Stories” column, published separately from “The Green Meadow Club”. He offered a certificate of club membership and a button with Cady’s drawing of Peter Rabbit to those who contributed. Through the efforts of roughly two thousand boys and girls, nearly four thousand sanctuaries were erected. They were situated in various parts of America and encompassed nine thousand acres of land. In 1919, after the war ended, the New York Zoological Society awarded Burgess with a gold medal of the Wild Life Protection Fund (33-34). His service to the protection of wildlife and the war efforts was recognized. As a writer of children’s fiction, it was a great honor to be acknowledged in the natural science world. A campaign arose in America during the Great War for the sale of war-savings stamps and thrift stamps among children. This was done for school children who could not afford to purchase Liberty bonds. The American government issued the sale of Liberty bonds in order to finance the war efforts in Europe. The chairman of the War Savings Committee in Sandwich, Massachusetts approached Thornton Burgess and appealed to him to produce five stories geared towards thrift and patriotism (Burgess 134-135). Consequently, the character of Happy Jack Squirrel was created. 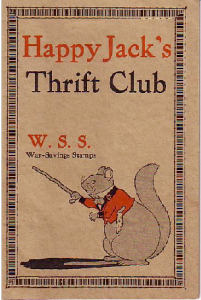 Burgess was able, through the stories of Happy Jack, to increase the sale of stamps. Before, school children did not understand their purpose and were uninterested in their teachers’ constant appeals. Thus, such stories of thrift, as told by an anthropomorphic squirrel, were much more engaging. Happy Jack was able to preach what the children could do to support America during the war, without appearing patronizing (138). Burgess employed a psychology of human superiority in these stories. Children would listen to Happy Jack only because they felt that they knew better than he did. Unlike their teachers who they looked to as their superiors, the children believed that what Happy Jack dictated was something they already took to be known and true. As a result, young readers were able to grasp the importance of thrift and patriotism as taught to them by an anthropomorphic squirrel (139). As a consequence, it became apparent to Burgess the power of anthropomorphism in storytelling, especially as to its effect on the efforts of children during WWI (140). In 1919, Thornton Burgess wrote The Adventures of Bob White as a response to the violence that accompanied the end of WWI. In this Bedtime Story-Book, he used the anthropomorphic quail, Bob White, to illuminate the danger of firearms (Connor 127). Bob White is wounded by a hunter and pays homage to the persecution of innocents during the Great War. Children can identify with the abjectness of the situation, while simultaneously feeling courageous, as someone is in more need than they are (128). The character of Bob White was being written as Little, Brown, and Company reprinted The Adventures of Old Mr. Toad. It would appear that the publishing company wished to use Mr. Toad to educate children within wartime with a less heavy hand than in The Adventures of Bob White. After conducting a thorough investigation into the production and reception history of The Adventures of Old Mr. Toad, I unearthed something most curious. Rather, there are no documented sources on such topics as it relates to the 1918 reprint of Old Mr. Toad. Thus, I have taken it upon myself to make inferences as to why that is. On the basis of research and educated decisions, I shall deduce why a hole exists in relation to production and reception history. The Bedtime Story-Books and the Mother West Wind series are the best-known collaborative works between Thornton W. Burgess and Harrison Cady. 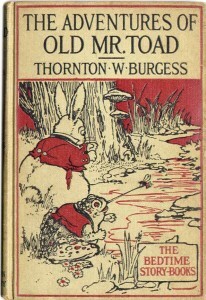 The Adventures of Old Mr. Toad is a part of the Bedtime Story-Books series, but the titular character was not one of Burgess’s most beloved. Rather, the recurring character of Peter Rabbit, inspired by Beatrix Potter’s character of the same name, was prolific. Eventually, this character was renamed Peter Cottontail. As well, Cady’s rise to fame was through the comic strip, Peter Rabbit, which ran in a weekly Sunday newspaper (Zipes 243). As a result, much of the research on production and reception history, as it relates to the partnership between Burgess and Cady, is on such a character. In fact, it would appear that Mr. Toad is all but forgotten and dismissed by readers of the Bedtime Story-Books. Interestingly, the story within Old Mr. Toad explores this very once-over: Peter Rabbit and the other woodland creatures realize that they had misjudged Mr. Toad, as they previously never paid him much attention. 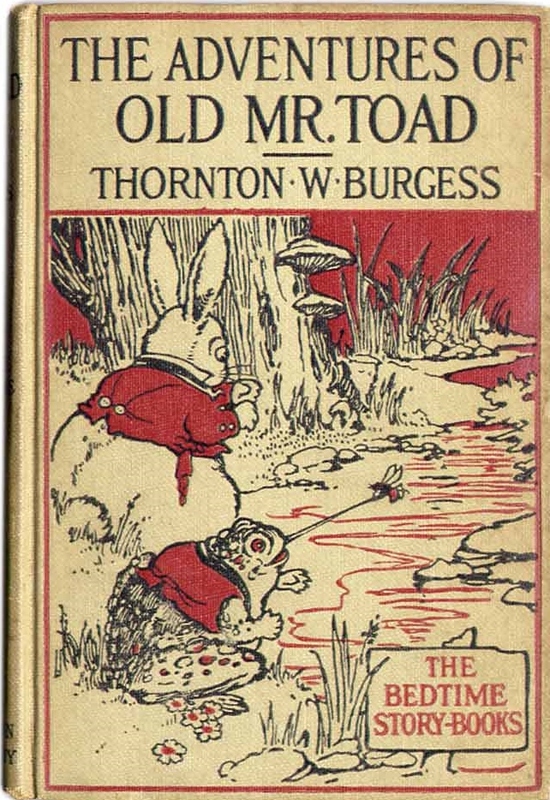 As Old Mr. Toad was not one of Thornton W. Burgess’s most popular characters, it is no wonder that I could not find any details on The Adventures of Old Mr. Toad. However, I can infer that the demand for anthropomorphic characters within children’s novels was on the rise during WWI, which could be reason for its reprint. Such stories contained morals and Burgess used the animals as instructors to teach children how to behave (Cullinan 131-132). Furthermore, the technique of anthropomorphism was used to arouse the imagination. Incidentally, Burgess was criticized for humanizing animals and nature, which seems contradictory to the aim of his animal and nature stories (Watson 116). He wished to provide a friendly face to such wild, untamed beings, realizing their value in the sustainability of the environment. As the 1918 reprint of Old Mr. Toad was released during a time of turmoil, it would appear that American children needed to learn how to behave at this time through Mr. Toad. Similarly to Happy Jack Squirrel and Bob White, Mr. Toad provided a lesson in morals and behaviour to the young boys and girls, as he encouraged them to be humble. Peter Rabbit also taught readers to not be so quick as to judge a book by its cover. These lessons are valuable for children and were regarded as important during the last year of the Great War. 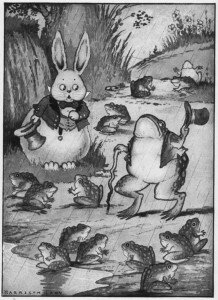 Anthropomorphism was a storytelling technique employed by Thornton Waldo Burgess in his novel, The Adventures of Old Mr. Toad. The increased demand for novels featuring such genre was on the rise during the final years of WWI. As an American author, Burgess’s original 1916 book of the same name was reprinted a mere two years later, in relation to the involvement of the United States in 1917. Such novels featuring anthropomorphic creatures were very popular at this time as they taught young readers morals and encouraged good behavior. In addition, they were very imaginative and could be enjoyed by both children and adults. Consequently, I have concluded that the publishing company, Little, Brown, and Company, chose to reprint Old Mr. Toad in 1918, as the titular character was able to instruct children without sounding as though he was preaching. Children are more likely to listen to the lessons being taught by an animal, in which they view themselves as superior, as opposed to parents, teachers, and other adults. This psychology enabled Burgess to become a beloved children’s novelist and provided the basis for Little, Brown, and Company’s reprint of The Adventures of Old Mr. Toad in the final year of the Great War. Burgess, Thornton W. Now I Remember: The Autobiography of Thornton W. Burgess. Boston: Little, Brown, and Company, 1960. 134-140. Print. Burgess, Thornton W. The Adventures of Old Mr. Toad. Illus. Harrison Cady. Boston: Little, Brown, and Company, 1918. Print. Connor, Kathleen M. Beyond the Words of a Storyteller: The Cine-Semiotic Play of the Abject, Terror and Community in the Anti-Hunting Trilogy of Thornton W. Burgess. Diss. University of Ottawa, 2007. Ottawa: privately published, 2007. 125-128. Web. Cullinan, Bernice E., and Diane G. Person. “Burgess, Thornton.” The Continuum Encyclopedia of Children’s Literature. New York: Continuum, 2001. 130-131. Print. Dowhan, Michael W. Introduction. Thornton W. Burgess, Harrison Cady: A Book, Magazine, and Newspaper Bibliography. By Michael W. Dowhan. New York: Carlton Press, 1990. 1-3. Print. Meigs, Frances B. My Grandfather, Thornton W. Burgess: An Intimate Portrait. Beverly, Massachusetts: Commonwealth Editions, 1998. Print. Oehlkers, Peter. 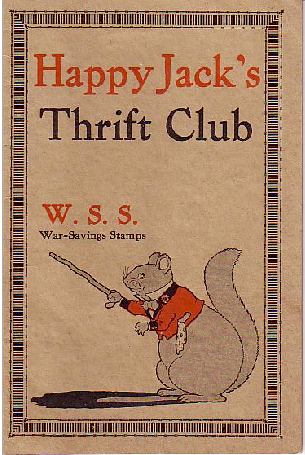 “Happy Jack’s Thrift Club.” Thornton W. Burgess Research League. N.p. 4 May 2010. Web. 18 March 2014. Tindall, George Brown. America: A Narrative History. 7th ed. New York: W. W. Norton, 2007. Print. “The Adventures of Old Mr. Toad.” Gutenberg. David Newman. 15 June 2004. Web. 18 March 2014. Watson, Victor. “Burgess, Thornton.” The Cambridge Guide to Children’s Books in English. New York: Cambridge University Press, 2001. 116. Print. Wright, Wayne W. “The Adventures of Old Mr. Toad.” Thornton W. Burgess, A Descriptive Book Bibliography. Sandwich, Massachusetts: Thornton W. Burgess Society, 1979. 49. Print. Zipes, Jack. “Burgess, Thornton W.” The Oxford Encyclopedia of Children’s Literature. Vol. 1. 4 vols. New York: Oxford University Press, 2006. 232. Print. Zipes, Jack. “Cady, Harrison.” The Oxford Encyclopedia of Children’s Literature. Vol. 1. 4 vols. New York: Oxford University Press, 2006. 243. Print.